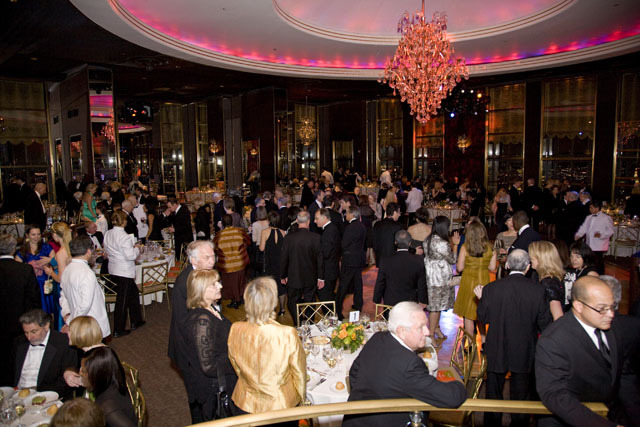 More than $571,000 was raised on October 30, 2008 for ASA's 2008 Gala, which was held high up in New York City's skyline at Rockefeller Center. Beginning many months earlier, Honorary Chairs Rosemary Harris and Billie Jean King jumpstarted ASA's 10th Annual Gala, making it the organization's second highest grossing fundraiser to date. NBC Sports interviewer and essayist Jimmy Roberts, as Master of Ceremonies, presided over the evening. The event's theme — Celebrating Innovation, Education, and Research - reverberated with all the guests as each awardee was carefully chosen for his vital and distinctive contributions to the global effort to eradicate skin disease. Golf legend Jack Nicklaus received the Lifetime Leadership Award in Outdoor Sports. Allergan, Inc. founder Gavin S. Herbert was presented with the Corporate Leadership Award. The Humanitarian Award was given to Harry C. "Hal" Dietz, M.D., Professor of Pediatrics, Medicine, and Molecular Biology & Genetics in the Institute of Genetic Medicine at the Johns Hopkins University School of Medicine. Kyoto University professor and Gladstone Institute of Cardiovascular Disease, University of California, San Francisco visiting scientist Shinya Yamanaka, M.D., Ph.D., was presented with the Lifetime Scientific Achievement Award. ASA announced the first recipient to receive the Abby S. and Howard P. Milstein Innovation Award for Melanoma/Non-Melanoma Skin Cancer Research. Boris C. Bastian, M.D. of the University of California, San Francisco, will further his research on The KIT signaling pathway as a therapeutic target in melanoma with a three-year grant of $750,000. Dancing to the world-renowned Ward Marston Orchestra capped a heartfelt evening.